The term ‘Holy Minimalism’ evolved in the late 1990s to describe the work of John Tavener of England, Arvo Pärt of Estonia, and Henryk Górecki of Poland. It was a style that went against the trend of complexity and towards a mood of contemplation. Forward motion was replaced with stasis; intellectualism was discarded in favor of spirituality. 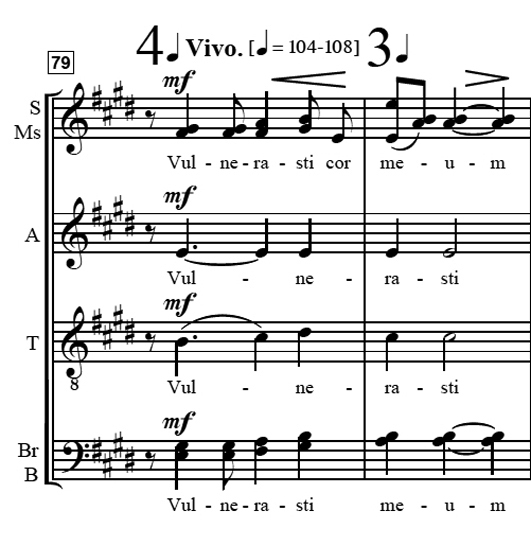 Each of the three Holy Minimalists were heavily influenced by techniques common in the medieval and Renaissance periods of choral music and frequently set their music to liturgical texts. 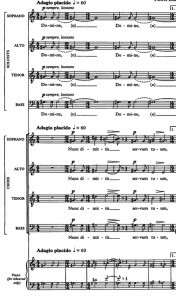 The influence of ‘Holy Minimalism’ spread to many composers throughout the world, including three contemporary Polish composers who are the subject of this article: Romuald Twardowski (b. 1930), Miłosz Bembinow (b. 1978), and Pawel Łukaszewski (b.1968). Composer Romuald Twardowski is a Professor of music at the Fryderyk Chopin University, one of the oldest and largest schools of music in Poland. His musical training included extensive studies at the conservatories in Vilnius and Warsaw as well as a year with Nadia Boulanger. Twardowski describes his approach to composition: I did appreciate the role and significance of tradition, finding in it inspiration for my own music. Assuming that extremes do meet, I looked to the medieval times, to the Gregorian chant to find pieces that, when combined with the achievements of the 20th Century of composition technique (aleatorism, cluster), would result in the desired synthesis of New and Old. 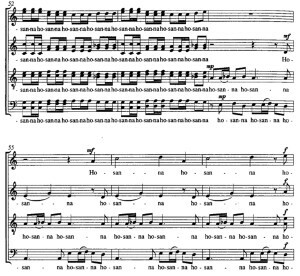 In his version, Twardowski simplifies the chant into a less florid form, shown in the male voices (Figure 2). 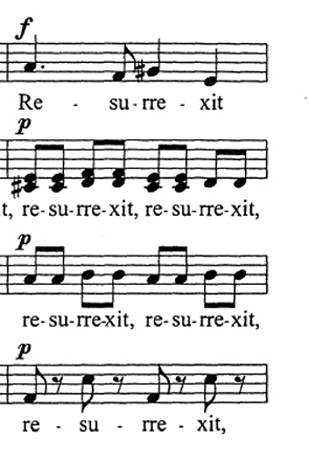 This contrast of chant and rhythm is a creative juxtaposition of ancient music and driving rhythm. The composer employs it twice more in the work. 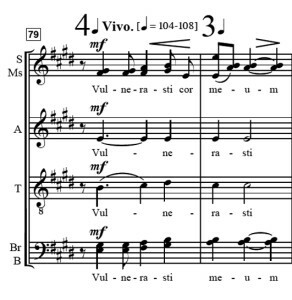 In the example in figure 3, the faster tempo “alleluia” slows into a chord that immediately resolves into a drone, a choice that emphasizes the feeling of mystery and connection to the past. In Regina Coeli, Twardowski has forged a joyful celebration of the traditional Marian text. Interwoven into the work is an occasional moment of mystery, primarily through a reappearance of the opening chant line. The majority of the short work features a triumphant Resurrexit theme and an assortment of joyful Alleluias, a common feature of Twardowski’s music (Figures 4 and 5). Twardowski demonstrates his mastery of the rhythmic motive in Hosanna II, a work he describes as a Concerto Breve für gemischten Chor. In this composition, the composer employs the repetition of motives to build complexity and forward motion. The effect is almost one of sequenced loops; once a motive begins in one voice, it is repeated as other voices add their own variation. 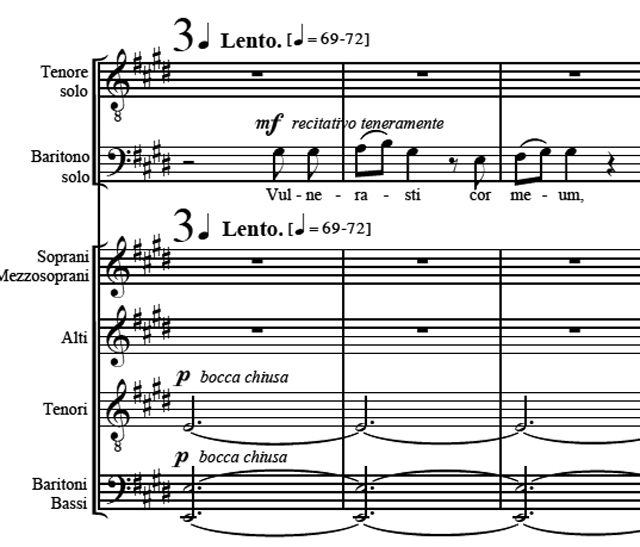 The music presented in Figure 6 is a slight variation of the opening measures of the work. There is an additive process at work here as well: musical motives are layered on to each other. 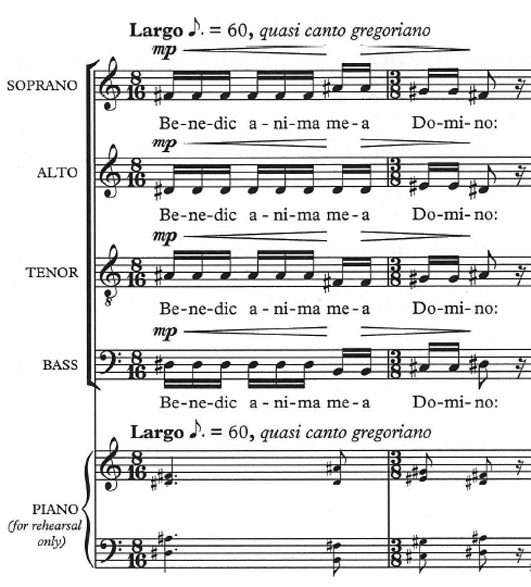 Eventually, the collection of short musical motives accompanies the more lyrical lines sung by the tenors and basses. 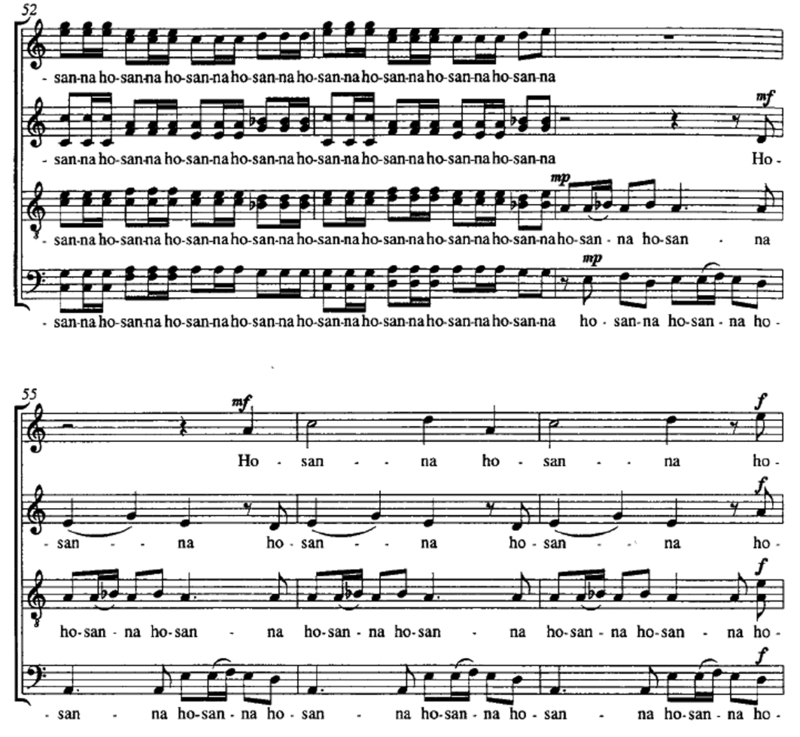 The roles shift later in the work (shown in Figure 7) when the men’s voices sing repeated motives, while the women’s voices have the more lyrical lines. Miłosz Bembinow also studied composition at the F. Chopin Academy of Music in Warsaw, where he is now employed as Assistant Professor (The Fryderyk Chopin University of Music). 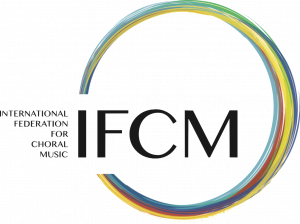 He is a well known composer in Poland and received the Młoda Polska (Young Poland) scholarship award from the Polish Ministry of Culture and National Heritage. His compositions are featured on over thirty recordings, winning the “Fryderyk” award for two of them. 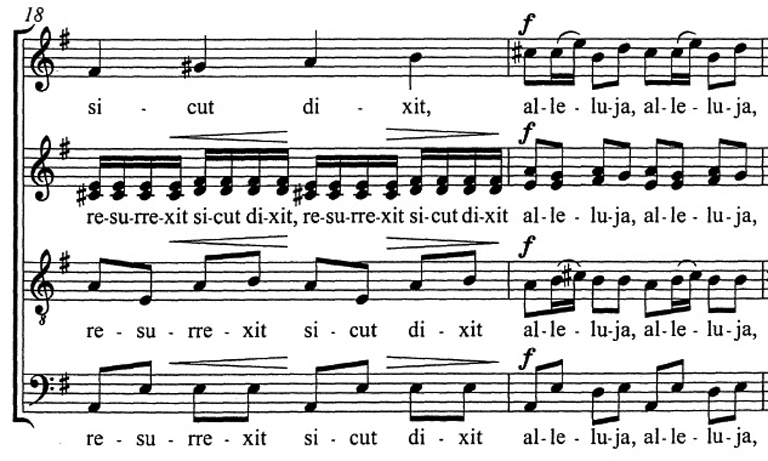 Bembinow’s liturgical compositions often begin with chant or chant-inspired phrases (Figure 8). 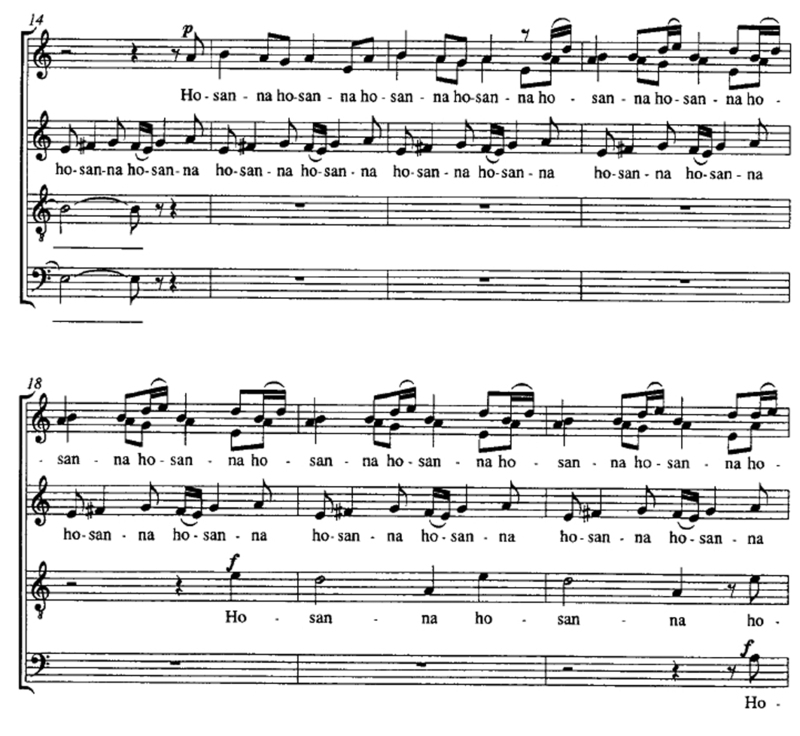 After opening with a unison line, the composer provides a twentieth-century harmonization to the melody in a style that is occasionally reminiscent of John Tavener’s The Lamb (Figure 9). Other Bembinow liturgical works utilize chant and medieval compositional devices in different ways. His award winning Veni Sancte Spiritus demonstrates medieval compositional devices in the context of twenty-first century harmonies. In Figure 11, note the frequent perfect fifth harmonies and juxtaposition of duple and triple figures. 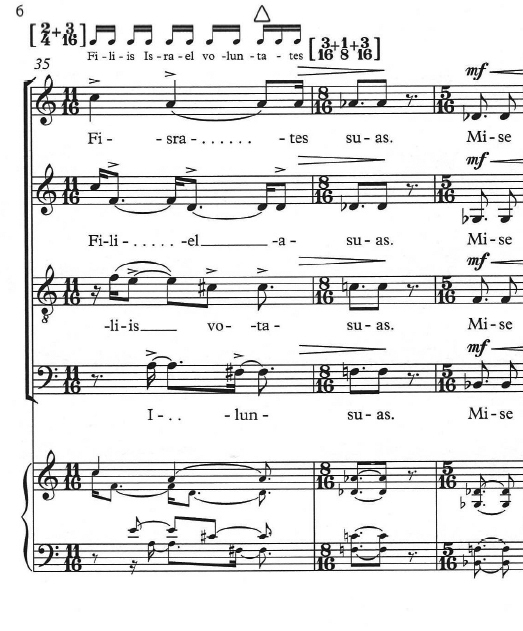 Vulnerasti Cor Meum is another work that begins with a chant-like figure, only this chant serves as source material for a work that is both rhythmic and varied. 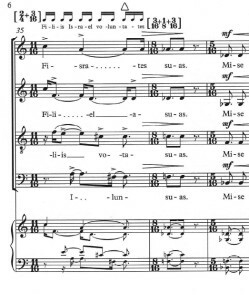 He begins the work with a drone-accompanied chant figure and then uses the shape of the chant to form a motive that is sung at a much faster tempo (Figure 12). Pawel Łukaszewski is an extremely prolific composer with major commissions from top choirs from all over the world; his music has been recorded by luminaries including Stephen Layton in 2008 and the Choir of Trinity College, Cambridge. Łukaszewski’s music is influenced by the mysticism of Pärt, Górecki, and Tavener, but the composer is unmistakably forging his own path with a unique voice, style, and technique. Much of his music features unique approaches to the techniques that are most associated with the Mystical composers. Chant dominates some of his compositions. 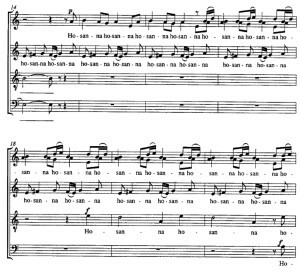 His Psalmus 129, composed in 1995 and changed in 2008, is a beautiful accompanied chant that is composed for double choir. 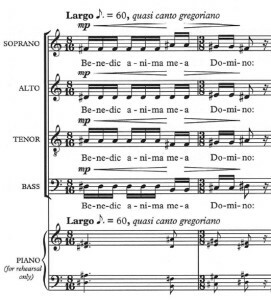 Although the composer gives strict metronome markings and numerous mixed meter markings to help those unfamiliar with performing chant, the piece sings itself. Although simple in its approach, it is marvelously effective in setting the penitential psalm best known as De Profundis (Figure 13). 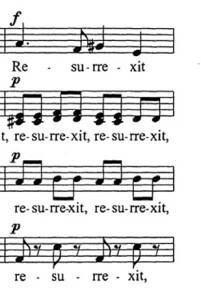 The composer takes a different approach to setting chant in Psalmus 102 (2003). 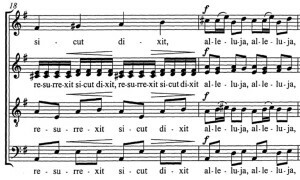 Instead of accompanying the chant line with primarily static chords as he did in Psalmus 129, the composer sets the chant line in a homophonic rhythm that is carefully set to give the Latin text a proper emphasis at the beginning of the work. 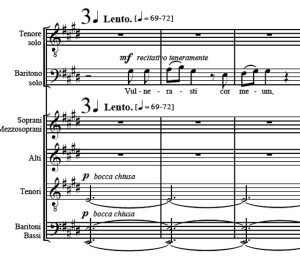 Later, he provides a contrasting section where the text is communicated in staggered entrances across the choir (Figure 14). 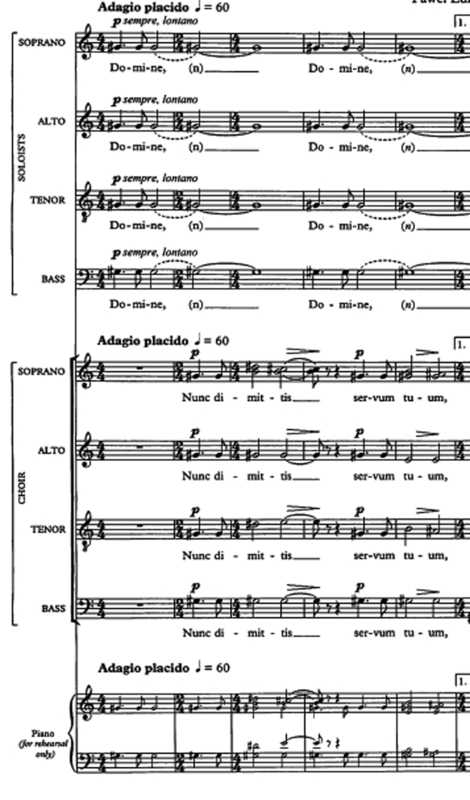 In one of his most popular choral works, Nunc Dimittis (2009), Łukaszewski employs a drone at the beginning that remains throughout most of the composition, given to a quartet of soloists. 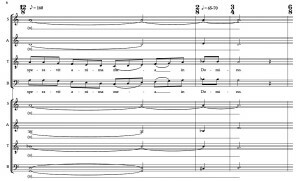 The rest of the choir provides a homophonic presentation of the text, exploring harmonies and dissonances which incorporate the drone note. 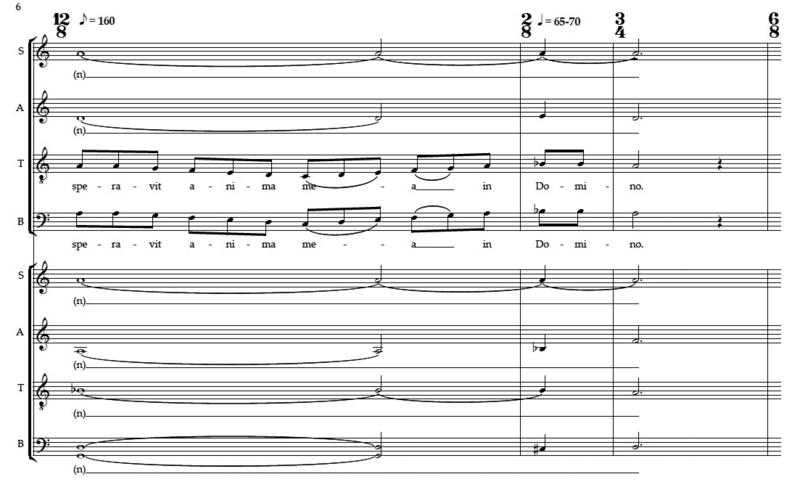 Later in the work (Figure 15), the drone dissolves into something resembling an occasional spiritual utterance by the solo quartet while the choral ensemble sings a repetitive series of chords which function as an ostinato, getting softer with each repetition. Łukaszewski is a composer who overflows with creative approaches to liturgical texts. He transforms techniques from the past into new tools for today. His approach is profound and his output is prolific; his music is better served by dissertations than by the limited words that can be devoted to him in this space. Other popular works include his Two Lenten Motets (1995), Antiphonae (1995-1999), and Terra Nova Et Caelum Novum (2006). The musical creations of Twardowski, Bembinow, and Łukaszewski capture some of the spiritual “aura” of Tavener, Pärt, and Górecki. While they maintain their individual voice, many of their works show an inclination to spirituality through their choice of liturgical texts, the use or influence of chant, and employment of the drone and ostinati. These three composers have perfectly captured the mystery and techniques of the past and fused them with the harmonies and devices of today.